Charge mobility is of crucial importance for efficiency in organic electronic devices such as field-effect transistors (OFETs), light-emitting diodes (OLEDs) and photovoltaic cells (OPVs). In the so-called hopping regime, charges move incoherently from site to site, with a rate determined by the charge transfer integrals, which are straightforwardly calculated with the unique fragment-based approach in ADF. This guided example explains how to calculate charge mobility with ADF (see also the demo video or download the input & output files). As a simple example we will study electron and hole mobility between two naphthalene molecules, starting with downloading the naphthalene dimer xyz file, cut out from the experimental crystal structure. For your own organic semiconductor material, you can just import the cif file, generate a supercell, and cut out dimers to calculate the charge mobility in different directions. When the jobs is finished, we search for the charge transfer integrals in the output. NOTE: if you use your own organic crystal where the two molecules do not have exactly the same geometry, you can come across this error ‘NO TRANSFORMATION FOUND’. In that case you will need to define two regions, each with their own monomer. Rather than selecting all and splitting by molecule, select one molecule at a time, and add a new region for both. With J the transfer integral, S the overlap, and ε the site energy. The generalized charge transfer integrals and the components are printed in the output. 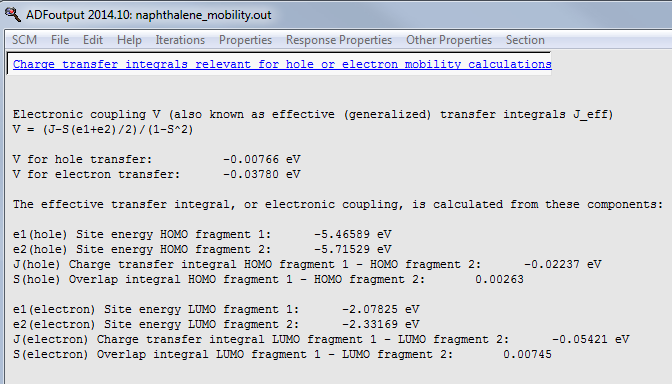 The electronic coupling between these two naphthalene molecules is thus calculated as -0.00766 eV for hole transport and -0.03780 eV for electron transport. Compare these values to the tab results in Coropceanu et al., J. Phys. Chem. C, 113, 4679 (2009).) The signs of J and S depend on the phase of the fragments. Since V2 is used in the Marcus equation, the sign does not affect the hopping rates. Delete 1 naphthalene molecule, uncheck ‘Use fragments’ in the Multilevel panel and ‘Charge transfer intergrals’ in the Properties: other panel, symmetrize (star icon in ADFinput) and optimize its geometry (in the main input panel switch from Preset: Single Point to Preset: Geometry optimization, save as different file). Save as different file and run. When the (Eanion(neutral)) calculation is finished, switch back to Geometry Optimization, save as another file and run to optimize the anion geometry. After that geometry is done, switch back to single point and set charge and spin to 0 and switch of unrestricted. Save again (fourth and final file) and run. Collect the four bonding energies (from the logfiles or by using ADFReport) and calculate λ which is around 0.27 eV at this level of theory. In our example (V = 6.06e-21 J, λ = 3.45e-20 J) the Marcus hopping rate for electrons is 6.45e12 s-1 at 300 K.
As recently shown by Sutton et al. (J. Phys. Chem. Lett., 4 919-924 (2013)), the transfer integrals depend strongly on the amount of exact exchange. The pure GGA PW91 has often been used with good results. Likewise, the site energies and reorganization energies will also depend on the functional used. For λ often hybrids are used in the literature. Other technical setting may affect the accuracy of the calculation as well: basis sets, integration grid, and density fitting. Pavanello and coworkers (M. Pavanello, T. van Voorhis, L. Visscher, and J. Neugebauer, An accurate and linear-scaling method for calculating charge-transfer excitation energies and diabatic couplings, J. Chem. Phys. 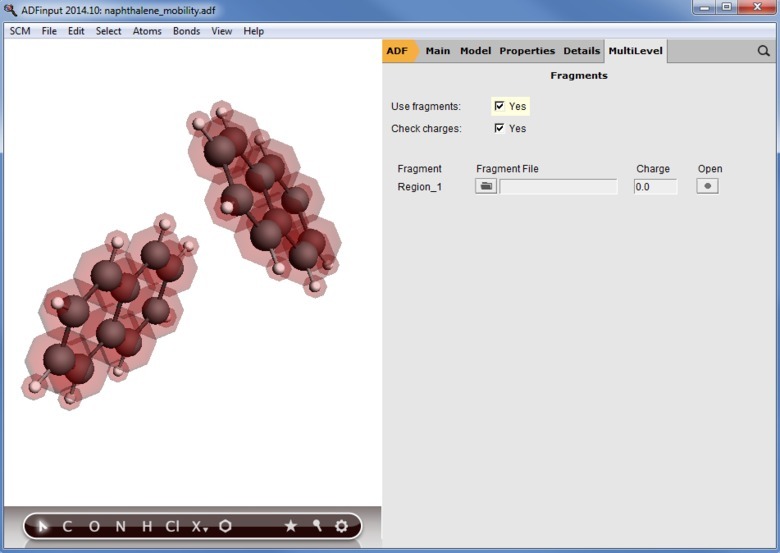 138, 054101 (2013)) have recently implemented electronic couplings with the frozen-density embedding framework in ADF. This approach also allows the inclusion of multiple molecules which will affect the electronic couplings. It is formally linear-scaling with the number of subsystems, hence enabling the study of environment effects on electronic transport in amorphous crystals. You can watch Michele’s web presentation on electronic couplings with FDE. When many charge transfer integrals are needed (e.g. an amorphous crystal with many different dimer orientations), the calculation may be speeded up. Energy decomposition may be switched off, the SCF cycles can be set to 0 (with typically a small effect on the integrals), and the preparation and analysis can be streamlined with scripts utilizing ADFprepare and ADFreport tools. Our periodic DFT code BAND can calculate the effective mass tensors, which are used in the coherent transport regime (band transport).